Well it happened again; support was discontinued for my favorite purchased Craigslist app, Craigslist+, by Escargot Studios, LLC. What I find particularly galling is that I contacted customer support and was told that the version I purchased is no longer supported. So much for the "free lifetime updates" that were promised. If the app was no longer in existence that would be one thing, but instead it seems that Escargot has released a "new" version that looks amazingly like the "old" unsupported version. This is the second time I've been burned by support ending (and being left with a non-working version) for a purchased app so for now I'm sticking to the free versions and this post is the result of my search for a new "go to" Craigslist app. In my quest, I identified 3 contenders; the "new" "cPRO" app from Escargot, Craigslistfree by Lifelike Apps Inc, and Craig's Times also by Lifelike. 1. cPro: Although I'm disgusted with the behaviour of Escargot, I continue to like the appearance of the listings the best of the 3. Initially, this seemed to be the obvious pick to run with; however, two substantial shortcomings became quickly apparent. First, every time that you open the app, you are prompted to purchase the "PRO+" upgrade. After previously purchasing their "upgrade" and being burned, this isn't going to happen (and is like salt in a wound as having paid for their app once it is aggravating to be subjected to the upgrade hustle and advertising). Second, in the current free version it appears that you are limited to one (1) saved search and when you try to save a second search, you are once again prompted to upgrade. I find this limitation intolerable; one saved search is not sufficient and it is cumbersome to have to set up searches and navigate screens to select categories for searches beyond your one search. 2. 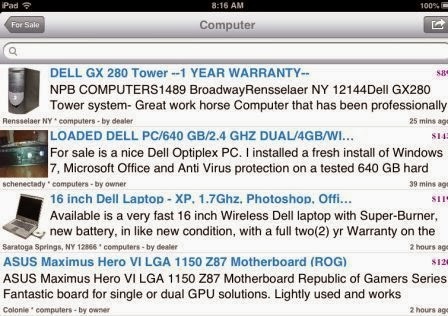 Craigslistfree: The good news for this app is its similarity to cPro and it does permit saving more than one search. (I've saved 4 as a test). While it is completely subjective, I don't like the smaller listings in Craigslistfree (in comparison to Cpro). It might be old eyes, but I find them harder to read. Initially I was excited to see a setting for font size; however, the font size is enlarged over 2 lines decreasing the amount of information provided in the view and the picture size remains unchanged. The second negative that I identified is that I found the navigation clunky for the way that I use Craigslist. 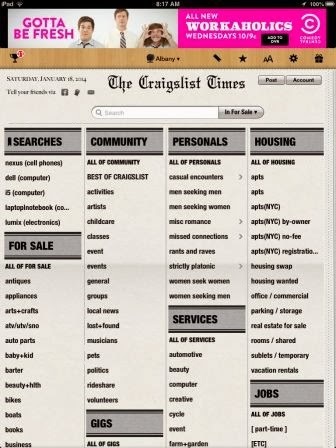 The main page of the app is set up with starting points of Saved Searches and the major categories of Craigslist (Community, For Sale, Gigs, etc). 3. Craigs Times: Admittedly, I was most skeptical of this app initially as the main page looked somewhat cluttered (similar to the actual site and why use an app if it mirrors the site). Additionally, in using the app, I found things that I didn't like. Specifically, I don't like the ads being placed near the user settings; with my big fingers, I sometimes accidentally click the ad. Second, after using the app regularly, I experienced periodic full page pop up ads. While you can quickly close these ads, I found them annoying nonetheless (although I did not find these nearly as frequent as the new prompts from cPRO to upgrade). My third criticism of this app is that, while infrequent, I found occasions where it locked up (generally an ad obscured the ability to navigate back). On these rare occasions, I was able to close the app to resolve the issue. A fourth final criticism is that I don't like the appearance of the search results / listings as well as cPro, but as with the Craigslistfree app the appearance is acceptable and this is merely a minor subjective opinion. To my own surprise (and perhaps surprising considering my noted criticisms), I found that I liked this app the best of the three. 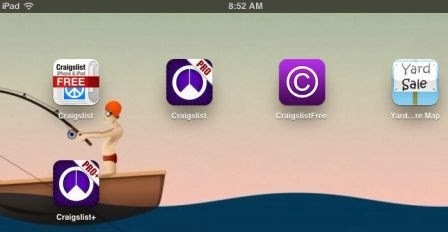 I found this app set up to quickly support the way I like to use Craigslist. For example, sometimes I'm curious and just want to browse a category - with this app, I can directly click the category from the main page. As reflected in the screen shot, this app supports saving more than one search. In contrast to the other offerings, the Saved Searches are individually presented on the main page so I can directly go to any of my saved searches (I don't have to go from main page to a separate Saved Searches page and then select the Search). ...and the winner is Craigs Times!